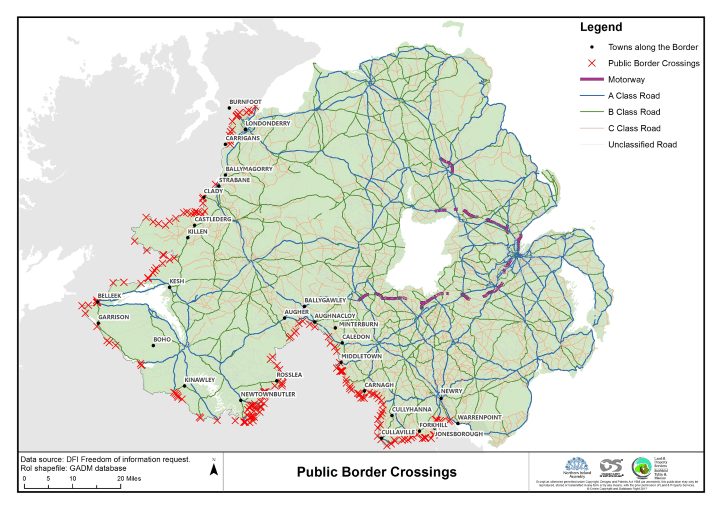 The map above shows 195 public road border crossing points between the Republic of Ireland & Northern Ireland. In total, there are somewhere between 208 and 275 public border crossing across the 499 km (310 mi) border. What’s amazing is that this is both more than the 137 land border crossings to the east of the EU. And far more than the 119 border crossings that exist between Canada and the United States, the world’s longest international border (8,891 km [5,525 mi]). While both Ireland and the UK are in the EU, the issue remains more or less a moot point. It’s more or less an open border. However, if the UK actually goes ahead leaves the Customs Union and Single Market it can’t be. With that in mind, it’s easier to see why the border issue is such a sticking point in the Brexit negotiations between the UK and the EU. Despite Brexiters’ claims to the contrary, the border issue is anything but easy. And to put things in a little historical perspective, during the Troubles only around 20 of the border crossings remained open, or less than 10% of the current total. It would be such a shame to throw away all that progress. Qu’en est-il de la frontière entre Gibraltar et l’Espagne ? What about Gibraltar and Spain ? Qual es el porvenir de la frontera entre Gibraltar y España ?